The Lake Achensee is a lake in Tyrol, north of Jenbach and wouldn′t be much to shout about, given that Austria has more than 300 lakes altogether. However, the Achensee is one of the few Tyrolean lakes and a particularly large one. Thus, it is very popular among tourists and domestic visitors and worth a separate article. As mentioned above, the lake is the biggest of the province and 133 metres deep. Its water is exceptionally pure and almost meets the requirements of tap water. Being a proper alpine lake, the Achensee rarely gets any warmer than 20 degrees. To make things worse, its position in a valley creates thermal motion that gives rise to a constant breeze. Therefore, the lake is hugely popular among windsurfers. The history of the Achensee is closely linked with the monastery of St. Georgenberg. The lake was given to the monastery by the county of Schlitters in 1120 and remained with it until 1919. Apart from tourism, the Achensee and a creek originating from it are used by a power plant. Tourism on the lake started - like in most areas of Tyrol - in the 19th century. In 1887, a steam boat named "St Joseph" was released to the lake. A few years later, in 1889, a narrow gauge railway opened and a second steam boat, "St Benedikt" (hooray!) started to entertain tourists. Others followed, until in 1911, the "Stadt Innsbruck" ("City of Innsbruck") joined the growing fleet as the first diesel boat of the Austrian-Hungarian Empire. Over the course of the next decades, the "Stadt Innsbruck" earned itself something like a legendary status and was in almost constant use until the 1990ies. 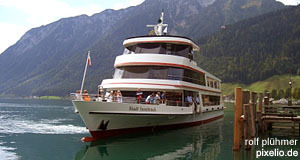 In 2006, a new ship called "Stadt Innsbruck" started to transport people on the Achensee. It has a capacity of 400 passengers, was built in Linz and cost 4 million Euros. Because of the adjacent power plant, the water level is - to some degree - regulated. It changes between summer and winter (when it is artificially lowered) for approximately six metres. One of the reasons why the Achensee is so popular for swimming and water sports is its vicinity to Tyrolean hubs like Innsbruck. Tourists often do day-trips to the lake and its surroundings because it is somewhat en-route for those that tour the Inn River Valley. Nearby attractions include Tyrolean highlights such as Schwaz, Rattenberg and Alpbach; and, a little bit further away, Hall and the capital Innsbruck. Following the Inn in the other direction, you will get to Kitzbühel and Kufstein.